After a shelter tent for homeless women and families closes this spring, Mayor Kevin Faulconer has decided to move the shelter run by nonprofit Father Joe’s Villages to the second floor of Golden Hall, an event center next to the city administration building. 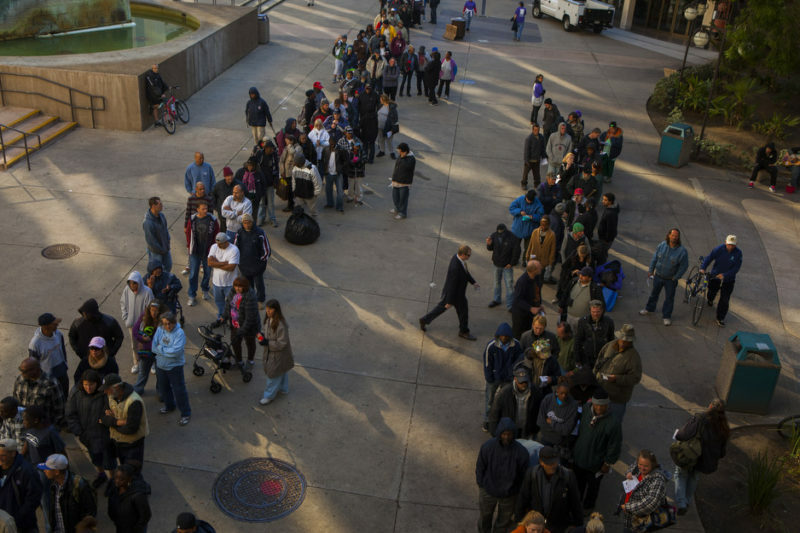 San Diego’s City Hall complex will soon house a homeless shelter. Golden Hall will likely shelter as many as 150 homeless San Diegans at a time for about three months, Faulconer spokesman Greg Block said Friday. For more than a year, Father Joe’s Villages has run one of three shelter tents on its plot at 14th and Commercial streets in East Village. But the nonprofit said early on that it planned to build a supportive housing facility there, meaning the shelter would need to close by spring 2019. For months, city officials have hurried to find a place to move homeless San Diegans and the tent itself. Now, Block said, the city has settled on both. The tent itself will eventually go up at 1710 Imperial Ave., a parking lot across the street from Father Joe’s St. Vincent de Paul campus in East Village. The city expects the process will take about three months, and Block said the city recently finalized a lease with the property owner. While Block said Friday he couldn’t immediately confirm the name of the property owner or other details of the lease, a Jan. 11 city notice first unearthed by the San Diego Union-Tribune said the property is owned by Breitbard Properties LLC. Before the city and Father Joe’s move the tent to that property, homeless families and women who aren’t connected with more permanent homes by a yet-to-be-determined date in April will move to Golden Hall, a site that’s often been floated by homeless advocates. Block said the shelter will continue to house homeless women and families when it moves to Golden Hall. Philanthropists Dan Shea and Peter Seidler, who donated the city’s two other bridge shelter tents, have for months pushed the city to consider Golden Hall as a backup plan once the Father Joe’s shelter comes down. City Councilman Chris Ward, who represents downtown, has also called for Golden Hall to be considered as a temporary housing site. Shea, a restaurateur, told Voice of San Diego last year that the suggestion had been rebuffed by city officials. Block said city officials had assessed a number of properties in more recent weeks, including the Old Central Library and recently closed Mission Hills Branch Library, and determined the second floor of Golden Hall would work best. Block estimated the event facility’s second floor could accommodate at least the roughly 150 people now staying at Father Joe’s Villages tent. Father Joe’s Villages CEO Deacon Jim Vargas said the city notified him on Thursday that it plans to shelter the agency’s bridge shelter clients at Golden Hall this spring. Vargas, who planned to tour the facility for the first time on Tuesday, said he was excited to hear Golden Hall could accommodate 150 people — the same number his shelter now does. “That would mean that nobody has to go back onto the streets, and that was one of my requirements, that no one would go back on the street,” Vargas said. Vargas said he is eager to work through logistics with the city starting next week. He said he looks forward to hashing out whether the shelter’s current on-site services including health care, childcare, employment services and more could also move to Golden Hall. Shea, Seidler and other philanthropists announced Friday afternoon that they planned to host a Monday press conference to discuss the temporary closure and relocation of the Father Joe’s shelter. Shea on Friday declined to comment on the city’s decision to temporarily move homeless San Diegans to Golden Hall. Block said Faulconer — who has often said the city can no longer wait for consensus on homeless-serving projects in the wake of the hepatitis A outbreak — decided recently to follow his own advice and reconsider Golden Hall. “Ultimately, the decision from the mayor is, ‘I’m the one who said we needed to start saying yes to things, so let’s take another look,’” Block said. For that reason, Block said, the mayor also plans to use Golden Hall as an occasional inclement weather shelter for homeless San Diegans once Father Joe’s shelter operation moves to the parking lot at 17th Street and Imperial Avenue.